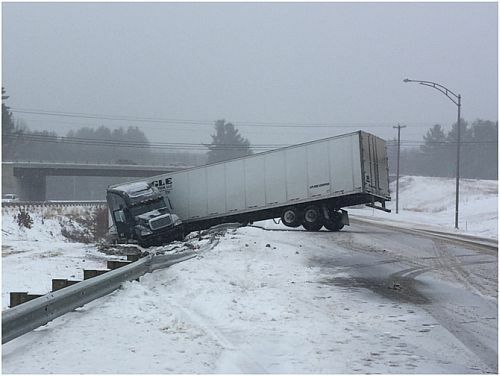 I-89 SB in Hopkinton was shut down for over 2 hours on Tuesday after a Tractor Trailer Jackknifed just after 11:00 am. Police say speed was a factor in the truck losing control and hitting a guardrail that caused the truck to block the passing lane. The driver Orangel Columbie Batista, age 49, of Dalton, GA. was not injured. Canaan’s newest police officer was sworn in on Monday. Town Clerk Vicky McAlister swore in Officer Courtland Smith. The ceremony took place in the Emergency Operations Center of the Canaan Public Safety Complex. After taking the Oath of Office, Canaan’s Chief Samuel Frank presented Officer Smith with his badge and police identification. Officer Smith’s Father retired Grantham Police Chief Russell Lary, pinned Officer Smith’s badge to his uniform. In 2011, Smith was certified as a full-time Police Officer and worked for the Enfield Police Department. In addition to being, a police officer Smith is also a Sergeant in the Vermont National Guard and spent one year deployed in Afghanistan. A fundraiser has been established for a Unity family who lost all their belongings in fire on Monday afternoon. Walter Kowalczyk and his family lost all of their belongings. All nine people living in the residence plus two dogs escaped without injuries. Donations can be made by going to https://www.gofundme.com/t6gnpjng. Three people are dead after a Cadillac Escalade and Tractor Trailer Truck met head on VT. Rte 4 yesterday afternoon. Police say Lashawn Jones 41 of Alpharetta, GA was driving a 2016 International tractor trailer east on US RT 4 and a Cadillac Escalade was traveling west when the crash occurred near Shady Knoll in Killington. Three people in the Escalade were deceased and three others were taken to Rutland Regional Medical Center for examination. Jones was also taken to the Rutland Regional Medical Center for evaluation. The Escalade was totaled and the International received severe front-end damage. Names of the victims are being held pending notification of family. A Springfield VT man was arrested on Saturday afternoon for receiving stolen property. Vermont State Police said Billy Joe Snide 46, purchased a John Deere snow blower from David and Michael Farnsworth in November. David and Michael Farnsworth were arrested in late November along with Zachary McNeill 23, and Paige Hillock 24 as part of theft ring in Chester. Vermont State Police arrested the Farnsworths along with Zachary McNeill and Joshua Congdon 26 in December for additional thefts throughout the area. The current whereabouts of the snow blower is unknown. Snide will appear in Windsor County Criminal Court on January 26, 2016 to answer the charges. The Farnsworths will appear in Windsor County Criminal Court January 19, 2016 to answer the Chester charges.